To us that were close to him, George was the greatest surfer that ever lived. He was really the only one left that spanned pretty much the whole of modern surfing from riding solid wood boards to the foam shortboard. We are so lucky to have walked in George’s footsteps. He showed us the line-up, he never left the line-up, he’s now there for perpetuity. Kama’aina kolohe kid, competitive paddler, Waikiki beachboy, adventurer, big-wave surfer, father, grandfather, husband, raconteur, surfboard shaper, weatherman, big-wave-contest organizer, kahuna, kupuna and giver of aloha – George Downing died in his sleep at 87-years-old, leaving in his wake a long, excellent history of ocean action and activism. A 1935 birthday announcement for five year old George Junior. Son of George Sr. and the former Miss Estelle Whitworth. Brother to Barbara and Melvin. Downing was born in 1930, which is prime vintage for a surfer, as that meant he was a child during the 30s, a teenager in the 40s, a young adult in the 1950s – which meant he was intoxicated by a simpler, more raw world – which moved slower than the modern world, but some would say better: “My father basically grew up on Waikiki Beach,” Keone Downing was quoted by Jackie Young in Hawaii Business Magazine. As a child in Honolulu in the 1930s, Downing learned to surf at age nine, and as a teen was best pals with Wally Froiseth. Those who know Waikiki and the South Shore of Oahu and have a little imagination, can only imagine the healthy, surf stoked and satiated life lived by Downing and Froiseth and their friends – in the shadow of Diamond Head, in the shadow of Duke Kahanamoku and Tom Blake and Woody Brown and other pioneering watermen and women who evolved surfing and surfboards and riding waves from Waikiki to Makaha and beyond. Gorgeous George montage from his page in The Encyclopedia of Surfing. Didn’t he look a bit like a studlier Anthony Perkins? In a 1996 interview with Malcolm Gault-Williams of the legendarysurfer.com website, Wally Froiseth detailed George’s early years as a child from a troubled home, who found a second family in the ocean – like many surfers to come: “Well, I was married to his [George’s] aunt,” Froiseth said to Malcolm Gault-Williams. The war was on. I got caught at Johnson Island when the war started, then I came back and we got married; ‘42-’43, around there. And Georgie was about – I don’t know – 11-12 years old, whatever it was. So, he stayed that summer, but he never left! What happened is, I eventually got divorced from – you know – his aunt. But, he stayed with me all the time. I put him through school, you know, cuz his father and mother kinda had problems. So, he stayed with me and I tried to keep him so he’d graduate. I was willing to put him through college, but he never did want to go. In fact, it was a hell of a time just keeping him in high school. 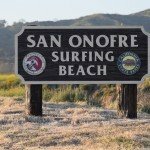 Like Hobie Alter and Jack O’Neill and Bruce Brown and many others, George was lucky to have been born a surfer and waterman in the 1930s, as he got to experience a Golden Age of water sports, and be intimately involved with the evolution of surfing, surfboards, paddleboarding and competition. Born in 1930, George began surfing on a solid redwood plank at Waikiki in the mid-1940s. A year or so later, his beach boy ukulele instructor recognized his lack of enthusiasm for afternoon lessons under the Hau tree and released him to the surf where he had already exhibited a predilection to excel. While working as a beachboy during and after the war, George encountered visitors from all walks of life, some of whom became enamored of the handsome and graceful young instructor, noting a potential for success at whatever wave he might choose. They bestowed on him advice in the ways of a world beyond the beach. One of his earliest shaping projects was to take a redwood plank given to him by “Uncle Brownie” at Waikiki in 1943 and make a more maneuverable “hot curl” design, with help from his friend Froiseth who first explored the concept in 1935. By changing the vee through the tail section to a semi-round shape, Downing was able to run a flatter bottom forward, and found what he referred to as “the board of my dreams.” Dubbing the board “Pepe,” Downing rode it all over the South and North Shores of Oahu, noting its amazing speed. The lessons he learned in altering the tail section of Pepe would lead to experiments with skegs (including the creation of a fin box) that would transform notions of what was possible on a surfboard. 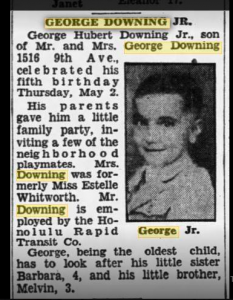 Downing was 15 when the war ended and that positioned him perfectly to benefit from a post-war world of peace and prosperity and travel and technology: Learning from all the visitors to Oahu and wondering what was there for George, beyond the horizon, outside of Oahu. In the latter years of World War II, as a young teenager, Downing lived with Wally Froiseth, one of the sport’s original big-wave riders and a co-creator of the racy hot curl surfboard. Froiseth taught Downing how to make boards, and introduced him to the big surf at Makaha, on the west side of Oahu; along with fellow Honolulu surfer Russ Takaki, they became the first to ride Laniakea on the North Shore, in 1946, as well as Maui’s Honolua Bay, in 1947. The following year the three men sailed to Southern California and spent two months surfing up and down the coast, a rarity at the time, as virtually all cross-Pacific surf travel involved California surfers visiting Hawaii. While in the Los Angeles area, Downing met with surfer/board designer Bob Simmons and learned how to fiberglass surfboards. George Downing, Wally Froiseth and Russ Takaki on the beach in Malibu, circa 1947. Their $25 jalopy Model A is behind them. That’s the board George ran into the Malibu Pier and was ding-repaired with newfangled plastics by Bob Simmons. Photo Xeroxed from the John Larronde Collection. In 1947, Downing. Froiseth and Russ Takaki went contra-flow to all the coast haole Californians making way to Hawaii when they sailed a TransPac yacht from Honolulu to San Diego. They had their Hawaiian boards, bought a jalopy, surfed Windansea and then motored up the coast to Malibu – where George collided his beloved Pepe hardwood board into the Malibu Pier and cracked the nose. At that time, a damaged board pretty much meant it was pau. But on the beach that day, Bob Simmons said he could fix George’s board – and that was the first time George Downing experienced fiberglass and resin. Matt Luttrell’s tribute to George on the Trim Hawaii Instagram. 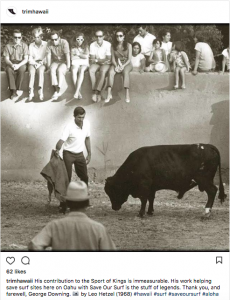 Downing was another surfer who appreciated the metaphor between big-wave surfing and bullfighting. Out of the 1940s and into the 1950s, Downing was one of a Happy Few that included Froiseth, John Kelly and Fran Heath who journeyed up the coast to Makaha, to test themselves in the wild surf that ran from the Point to the Bowl – and just didn’t seem makeable. Makaha came into play after Kelly camped there on a dive trip and returned home raving about the surf. Makaha Point waves became the new frontier and George an eager explorer. The Hawaiian’s hot curl plan shapes became the basis for the modern big wave surfboard. 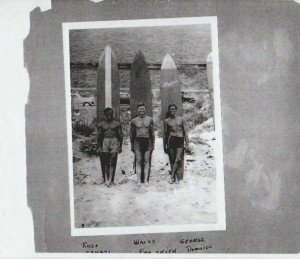 Primary architects and test pilots were George, Wally Froiseth, and their elder guru Woody Brown, Always an experimenter, George and his decade-older mentor Wally Froiseth played together with surfboard design. 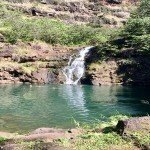 One would swim out at Makaha wearing a mask to hang underwater and watch the other ride by, observing the water flow off the bottom, then they’d go in, revise the board right there on the beach and try it again. Through the late 1940s, George rode his beloved redwood plank “Pepe” at Makaha. It was a heavy, fast-tracking hot curl that he and Wally had shaped out of an already aged “plank” belonging to a beach boy named ”Brownie” who had awarded it to young Georgie, sensing he had a future. 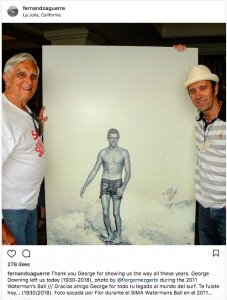 Fernando Aguerre with George Downing and an image of George surfing Waikiki in the 1950s. From Fernando’s Instagram. Necessity was the mother of the invention of the modern big-wave gun. Giant Makaha on wooden surfboards with no leashes was unforgiving. A wipeout meant a long lonely lifeguardless swim to the beach, where you might find a hard-earned surfboard in pieces. Downing and friends evolved big-wave guns out of sheer necessity. Those heaving Makaha walls challenged them, and they put their heads together to divine surfboards that could make the drop and haul across the wall. In 1950, Downing produced the first in a new generation of big-wave surfboards. The hot curl had been finless, made primarily from redwood, and finished with varnish; “Rocket,” Downing’s new 10-footer, was narrow-tailed like the hot curls, but built with balsa, fiberglass, and resin; it also had a removable fin—the first of its kind. On this new board, Downing was able to ride bigger waves than anybody before him, and by the mid-’50s he and Froiseth, along with Woody Brown and Californian-born surfers Walter Hoffman and Buzzy Trent, had cracked the 20-foot barrier at Makaha. Downing, Trent, and Froiseth were the standout riders on a glassy Makaha afternoon on January 13, 1958, when the waves were roaring in at 30 foot. 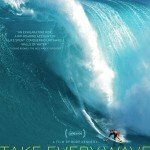 Go find surf movies from the 1950s and watch the Makaha sections and you will see George Downing going BIG – paddling wooden surfboards into heaving walls, air-dropping, re-connecting and hauling okole through the Bowl – a surfer ahead of his time, who blazed the path for all the big wave shenanigans to come. Downing was long and lean the way a steel cable holding up a bridge is long and lean. He looked a bit like the actor Anthony Perkins from the Hitchcock movie Psycho. Downing was equal parts quiet and aloof or full of gregarious aloha – as moody as the ocean that surrounded him on all sides. As a competitor, won the Makaha International at Makaha in 1954 and then again in 1961 and 1965, finished runner-up in 1966 and fourth in 1968. Downing came in seventh at the 1965 World Championships, second in the 1967 Duke Kahanamoku Invitational and third in the 1968 Peru International. In 1970, at 40 years old, Downing finished fourth in Peru, for his last competitive surfing event. 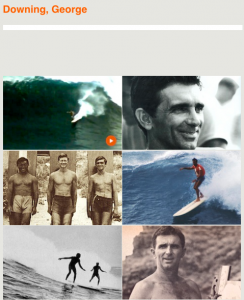 Although he coached the Hawaiian team to victory at the 1968 World Surfing Championships. Much of Downing’s success in the surf had to do with his skills as a paddler. As a competitive paddler, Downing had a healthy rivalry with coast haole Tommy Zahn during the 50s and into the 1960s. He competed in Hawaii and on the mainland and laid down records that still hold, decades later. In addition to his unique big wave-riding prowess, all through the war and post-war period, George won the Diamond Head paddleboard races, becoming a standard bearer for that skill, and the fastest paddleboard racer in all distance categories who, currently in his early 80s, still happens to hold the record for the 100-yard sprint. In 1960, Downing took over operation of the Waikiki Beach Center, acting as kahuna to hundreds of thousands of tourists who came to Waikiki for the waters – and were shown the secrets of the sea by George and his ohana. George married Gildea and had three children: Daughter Kaiulu and sons Keone and Kainoa. All three younger Downings have raced canoes for the Outrigger Canoe Club and have been victorious in the grueling Molokai to Oahu canoe race – with the Downing boys combining for five total wins. Passenger jets and statehood in 1959 transformed Hawaii and Oahu from a sleepy Pacific outpost to something much busier and livelier. All those service people who had flooded through Oahu during the war came back with their families and friends. And they told two friends…. So out of the 1950s and into the 1960s, Oahu was booming and there were opportunities for akamai Hawaiians with water skills. In 1960, George took over the operation of the Waikiki Beach Center, serving the tourist hordes that swarmed the sand and surf of Waikiki with rentals and lessons. All through those years he continued to tap standout swells at Sunset, Laniakea, Makaha, and at the traditional Waikiki big wave break far outside the Natatorium, Castle Surf. His daughter Kaiulu, and sons Keone and Kainoa are all accomplished water athletes in canoe paddling and surfing, all three have raced canoes for the Outrigger Canoe Club, all have won the Molokai to Oahu canoe race considered the World Championships of open ocean racing with the boys winning five times, a three-man canoe surfing competition held in big Castles surf, Kainoa was finalist in the Pipe Masters, and Keone having been ranked as high as fifth in the world at 16 years of age competed in the World Amateur Championships and on the World Professional Tour. As one of the evolutionists of modern surfboards for small surf and giant surf, George Downing was one of the pioneers of the surf industrial complex that began to grow and mutate and flex from the 1960s into the 1970s. With a family to support, George got busy. Originally the International Surf Center had two stores. George ran the outlet on Kapahulu Avenue while a friend ran the other on Keeaumoku Street. The Keeaumoku Street store closed in the early 1970s, and the remaining store on Kapahulu was rebranded Wave Crest Hawaii. In 1978, George Downing relocated the business to Waialae Avenue in Kaimuki and re-christened it Downing Hawaii. In the early ’70s, the Keeaumoku Street store closed and the remaining store was rebranded as Wave Crest Hawaii. In 1978, George moved the business to its present location on Waialae Avenue in Kaimuki and incorporated it as Downing Hawaii. The family owns the building and the land it stands on – a good thing. “We’re Hawaii’s oldest surf shop,” Keone Downing said in Hawaii Business Journal. 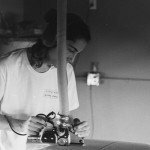 “My father was the first to bring foam surfboards to Hawaii in 1959, due to his friendship with manufacturers Hobie Alter and Gordon Clark; we became their exclusive distributor. Downing Hawaii did good business from the mid-70s to the mid-90s, opening a second store – Get Wet – at Windward Mall in the early 80s and then a second branch of Downing Hawaii at the Windward Mall in the early 90s. Both Windward Mall stores closed during the weak local economy of the 1990s, but Downing Hawaii is going strong in Kaimuki. George worked the store until he was in his late 70s. Keone took over the management of the story in 2005. The Eddie Aikau big wave memorial has produced some great surfing, but also a lot of great art. 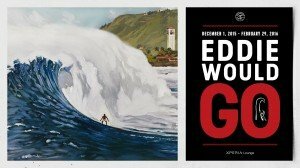 In 1984, Downing became the creator and Godfather of the big-wave contest held in honor of another Hawaiian waterman – Eddie Aikau. The contest would be held only on the biggest, cleanest swells that paid tribute to Eddie Aikau – and all of Hawaii. In 1990, Downing gave the green light to a giant, clean swell which lit up Waimea Bay and threw three generations of great big-wave surfers into hellacious Waimea Bay. Keone Downing came out on top in that 1990 Eddie, using that inherited Downing wave sense to pick off the big, clean ones, riding them steep and deep and come out standing – and victorious. Downing created the format for the Quiksilver in Memory of Eddie Aikau at Waimea Bay, showcasing the rebirth of big wave riding and offering the biggest winner’s check in surfing history. The unique event protocol of not being held in less than 20’ conditions causes it to happen with unpredictable frequency, which lends each actual competition added gravitas. George has steered The Eddie through the normal entanglements which he has as skillfully navigated as he once did the channel at Laniakea, knowing that the rip current there runs out underneath the incoming waves, thus you must not dive down, stay in the white water to get in. At least several times each season George makes the on-or-off call that itself causes ripples around the world. 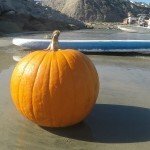 From November through February, he remains focused on the swell buoys. On mornings pregnant with possibility, he and his pickup truck can be found in the gray of first light, overlooking the Bay, with George keenly confirming his diagnosis so as to make the early call that is necessary either way. The event that George has nurtured for over two-and-a-half decades has helped reestablish the preeminence of riding big waving within the surfing culture. 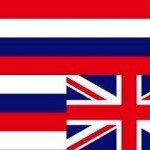 As of the winter of 2017/2018, the future of The Eddie had fallen into doubt because of Hawaiian politics. It is unclear what the passing of George Downing will have on the future of The Eddie – because that contest was his baby. Regardless of the future of The Eddie, George Downing left behind a significant wake of adventure, innovation, evolution. If they ever carve a Mount Rushmore-like tribute to Hawaiian watermen on Diamond Head, George’s noble profile would be up there, alongside Duke Kahanamoku and Rabbit and Eddie and dem. Wingnut’s Instagram tribute to George Downing. 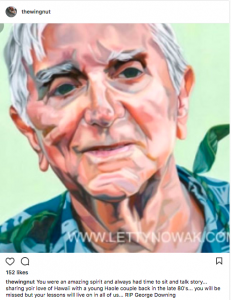 Art by lettynowak.com. 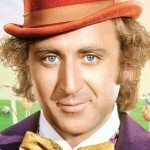 When news of George’s passing hit the Coconet (the new, modern, digital name for the analog Coconut Wireless) tributes rang out across the world. George Downing…A man of water. He is like water. Not because he has spent a large part of his life in it, but because water is one of the purest compounds that exists. Our planet is unique, and certainly most beautiful, because of it. Approximately seventy-five percent of our bodies are composed of water; from it we are born, and eventually, to it we will return. A marriage of hydrogen and oxygen, it permeates our lives with an indelible beauty; gentle, subtle, yet possessing potential to wreak carnage. Water can take on any form of its choosing, and although it can change itself into many forms, it will always be true to what it is. Water. If George Downing were an earthly element, he most certainly would be water. Downing is survived by sons Keone (Leayne) and Kainoa (Laurie) Downing, daughter Kaiulu Downing, grandchildren Kaohi, Kirra, Kainoa, Keola and Nalei, and two great-grandsons. George’s wife Gildea Lauwe Downing is waiting for him in that Surfer’s Valhalla alongside Rabbit and Brock and Woody and Wally and dem. 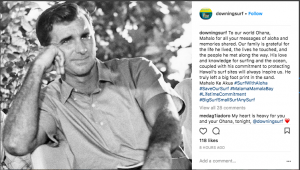 Funeral arrangements have not been announced but you can expect a major outpouring of flowers, songs, stories, canoes, emotion, tributes and people from Hawaii and around the world to say aloha to a man whose ocean efforts have effected so many, going back to the 1930s. 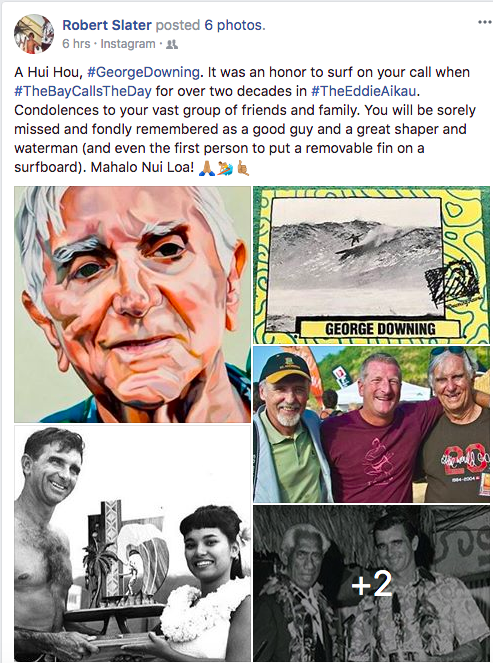 A George Downing portrait and tribute on the Downing Surf Facebook page.